On each of these delicate earrings, a blossom, a bud, and a leaf cluster together on a twisted, antiqued-brass coloured ring. 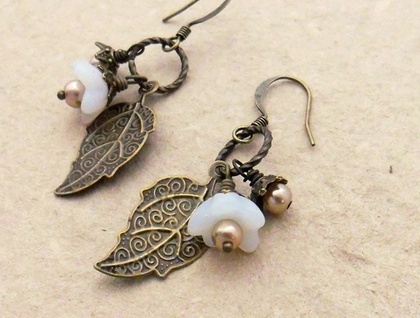 The little blossoms are made of opal-hued glass, topped with antiqued-bronze coloured bead-caps, and their centres are made from pinkish, pale fawn glass pearls. 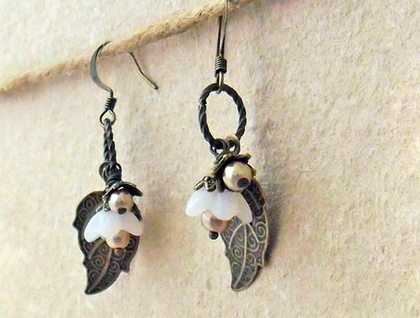 Another bead cap and faux pearl forms each bud, and each trio is completed by an antiqued-bronze coloured leaf charm which is decorated all over with veining patterns and little koru-like shapes. A very dainty, spring-like design. The 'White Blossom Cluster' earrings measure 48mm from top to bottom. 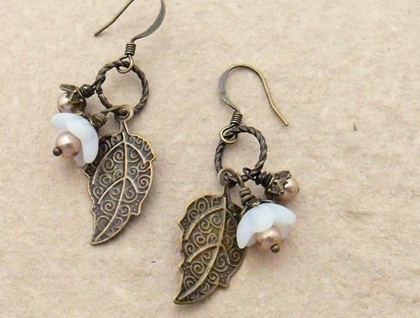 From the bottom of the ear hooks, the clusters measure 34mm, and the leaf charms measure 26mm long and 13mm across. These cluster earrings are lightweight and easy to wear. 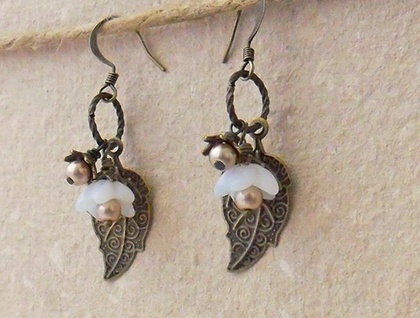 The ear hooks are brass based and are without nickel.